Coral reefs cover less than 1% of the world's surface and yet, are among the most diverse, complex and productive ecosystems on Earth. Coral reefs provide an estimated 25% of the fish catch of developing countries, are a source of employment and leisure, and encourage the development of tourism, as well as performing vital functions in protection against storm damage and erosion. 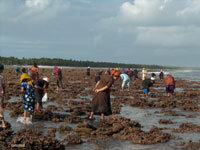 Increasing pressure on coral reefs has lead to reef degradation and is linked to the loss of economic opportunities. It is presenting growing challenges to the livelihoods of local communities. Reef degradation is associated with increasing poverty in most coral reef areas of the world, highlighting the crucial economic and social roles of coral reefs in the lives of many of the world's poorest coastal and island communities. Humans need coral reefs. 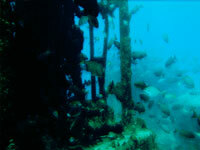 Consequently, effective management that promotes the sustainable use of marine resources is critical. 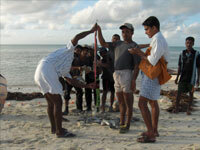 CARESS recognises that reefs and people are inextricably linked, and has made a commitment to improve the health of coral reefs in India by creating opportunities for communities to take charge of their environment, helping them to develop the skills and tools needed to ensure the long-term vitality of coral reefs. Our projects sites are the Agatti Island and Minicoy Island in the U.T of Lakshadweep and at Havelock Island, Andaman and Nicobar Islands. 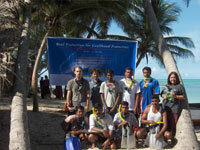 Site Partners: Maliku Development Society (Minicoy), Agatti Coral Reef Monitoring Network (Agatti), CGH Earth, and Barefoot leisure Resorts (Havelock). Project supporters past and present: SEACOLOGY, CCD through Ford Foundation, UNEP, ICRAN, IUCN, CORDIO, GCRMN South Asia, MSSRF through National Biodiversity Development Board. CEE, through Ministry of Human Resource Development, NEAC Ministry of Environment and Forests. 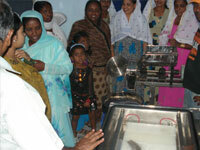 Minicoy women receive training in running a Vaccum Packing machine.